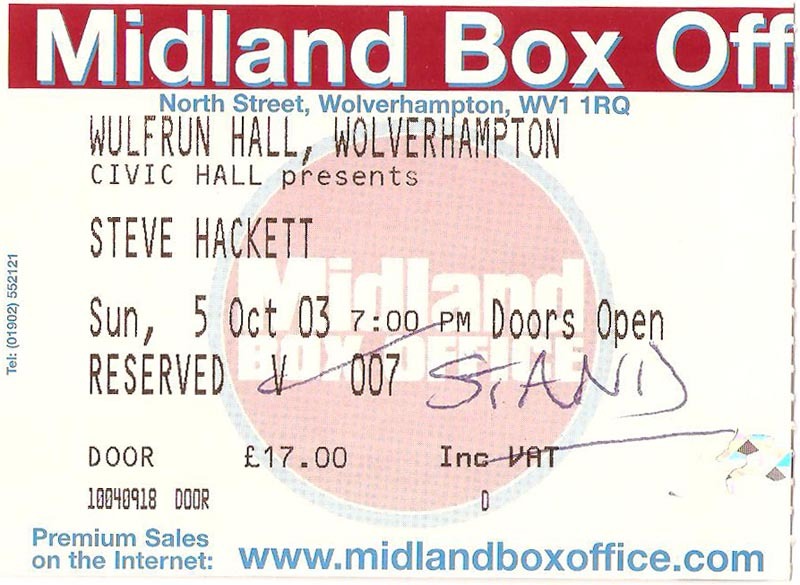 I found out through the Internet that Steve Hackett was touring near to me, over in Wolverhampton. 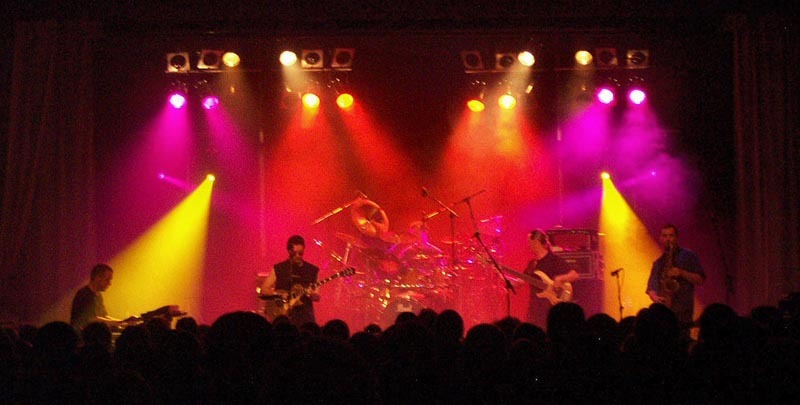 I had never seen Steve Hackett live, although I have purchased and watched his Live In South America DVD about a month before so I had a rough idea of what I was in for. It was a Sunday and I was bored so I made my way over to Wolverhampton and I thought I would be able to just amble up and buy a ticket, I was in for a surprise the show was SOLD OUT. I got round to the box office which wasn’t located in the venue and the woman in the box office sold me a standing only ticket. I finally got my ticket for an excellent sum of £17.00 alas it was standing only, well the first track started and from that moment I was hooked. Of course some of the songs played were quite familiar being Genesis songs from Steve’s time in the band but some of the solo material was familiar to the Live in South America set list so I wasn’t entirely under rehearsed. I was not to know it at the time but I would end up becoming a huge fan by the end of the gig. Time soon flew by and the show ended and I wanted more I did buy the obligatory Tour T Shirt (It doesn’t fit me now) and I did buy Darktown as well. Little did I know that Steve actually comes out afterwards to meet his fans usually by the merchandise desk to sign things and to pose for photos with fans, something which I must add is very rare in this day and age. Steve wasn’t well and his tour manager made sure that Steve didn’t over do it after the show. I had a few things signed and even got my photo taken with me and Steve Hackett. I got lost leaving the venue trying to find my car I ended up finding the local Police station and they themselves were not overly helpful but in the end I found my car, and I recall the drive back down the M6 to coventry. 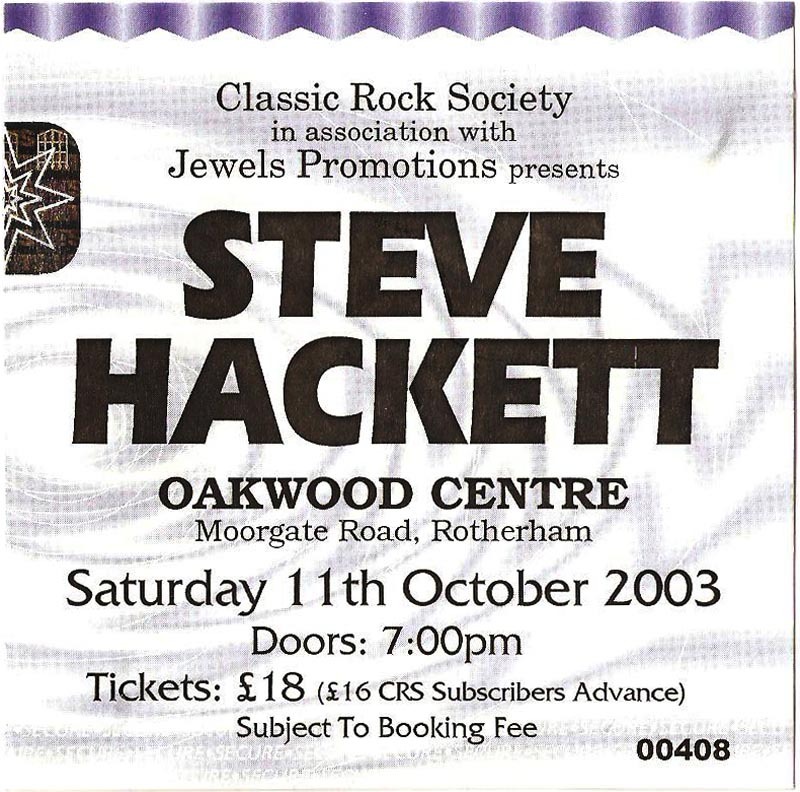 I had bought the ticket for this show about two days after seeing Steve at Wolverhampton, I had never travelled to Rotherham before so I left in plenty of time and I had arrived too early I even saw Steve and the band arrive in a Mercedes mini bus. (I am not one of those groupie types honest) Time soon flew by and I was lucky enough to hear bits and bobs of the sound check, the doors soon opened and I entered into the building and bought a soft drink. When I entered the main hall I noticed it was standing only, but that didn’t put me off. I enjoyed this gig and I took some photos (I stood very close to one side of the PA so my ears did ring after the show). The gig flew by, with one exception Steve’s brother John Hackett (playing the flute) joining him for the piece called Jacuzzi which was very nice. Of course by this stage I was getting to know the songs in terms of the music and lighting cues. I got chatting with the tour manager Paul Clark and I said I hope to be at the Leicester gig, he mentioned that if I was there he would try and arrange a photo pass for me, and Paul Clark being a photographer he gave me advice as to which songs were best to take photos with regard to the lighting cues and which background colours are the best or the worst to take photos in amongst other techical photography information some of which went clean over my head. The gig flew by and at the end of Brand New, Steve says “Sadly we have come to the last number” which is followed by lots of playful boo’s , Steve then says “I Didn’t say how long it was did I” which is followed by Laughing from the Audience then an enthusiastic audience member calls out for Supper’s Ready, Steve replies with “Now this one, No no its not Supper’s Ready No we can’t do that no I’m sorry” (Playfully teasing the audience), The Audience laughed some more, Steve replies with “ Its just a light snack compared with that one” The audience laughs more , Steve “It’s called…It’s our version of Los Endos” . At the end of Myopia/Los Endos there was a standing ovation and cries of MORE…Steve and the band re-emerge on stage play the encore’s and Steve and the whole band came out and signed items (this included the tour programme I bought from the merchandise desk) and then the band posed for photos and answered questions from fans. The journey home seem to take forever and I even had to stop for a rest at Leicester Forest East services I finally got in around 1am. I arrived at this gig after a long drive, I had agreed to pick up the assistant tour merchandiser Alan Hewitt from the Genesis fanzine TWR from Liverpool (this involved leaving Coventry at 6am and a two hour drive to Liverpool). We both witnessed one of the last flights of Concorde which was on a tour of sorts to celebrate its final year in service, the flight we witnessed flew into Birmingham Airport across the M6 which was a stunning sight to see but also a sad one. Alan and I were met by a mutual friend who took us from Coventry to Leicester in his car, he had the hassle of finding the venue and parking. We got to the outside of the hall and our mutual friend remarked on how the Australian Pink Floyd were playing the venue in the coming week. 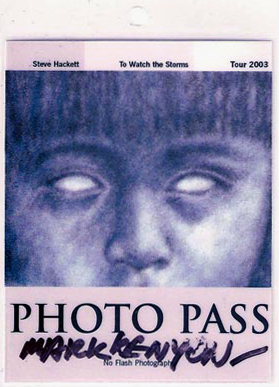 Once inside I got chatting with Paul Clark and he issued me with a laminate photo pass which he and I had spoke about at the Rotherham gig. Sadly it seemed that only 200 people had bothered to turn out to the De Montfort hall but those of us who were there more than made up for it. The show seemed to thunder along and I was busy taking photos and swapping seats to gain a better view for the camera as there were a few spare seats to upgrade my vantage point available. Steve and Terry take to the limelight. At some stage the venue staff approached me and asked to see my photo pass which I produced and after that I was left alone to take photos some of which came out quite nicely (looking back the camera was cheap and awful). Sadly during Spectral Mornings (A Stage Classic) Steve’s guitar string broke on the gold finished Fernandes, His guitar tech Richard Buckland was soon quick to swap it over with another guitar a Burny Les Paul in Black. With the gig over Steve and the band came out to sign items, pose for photos and even answer questions the band were in good spirits considering the earlier incident during Spectral Mornings. I went from the gig with a few fellow fans to pub in Leicester and we chatted about the gig and whether any of us were going to see the rest of the tour. A lift back to Coventry from a mutual friend then sleep, the tour continued down south with a gig in Deal, Kent but plans to attend fell through so I concentrated on the gig at The QEH. I arrived at this gig via the Tube the venue in question was the Queen Elizabeth Hall which is more likely home to Classical performances rather than Rock/Prog rock performances. Earlier in the day I had bought better tickets than those offered to me for face value (honest) from a guy who advertised them on the Official Genesis forum and I had a front row view of the whole gig, little did anyone know but Tony Banks of Genesis was in attendance that night. Paul Clark walked past before the start of the gig and he spotted me and he then noticed the pass he had given me at Leicester and he remarked that I was cheeky and I was not to use flash photography but he did let me use the photo pass from Leicester, I managed to get some much better photos from my vantage point of the front row including the one featured here I took during the song Mechanical Bride. I had grown used to the strobing lights during Mechanical Bride, I have a new found appreciation for Steve’s musical history and I even liked some of the songs that the real die hard fans found hard to love such as Vampire with a healthy appetite. Strobe lighting during Mechanical Bride as Steve stuns the audience. At this stage of the tour I had got to know the set along with the lighting cues which made it easier to take better photos, I had also got to know the tour manager and earned his trust hence the photo pass, I had come to know of the band, I had some great conversations with the sound engineer and lighting engineer some of which I sadly cannot repeat. The show over, sadly Steve and the band had many guests to entertain backstage and so he didn’t come out for a signing. Thus I got the tube back to Epping and that was the end of the tour. 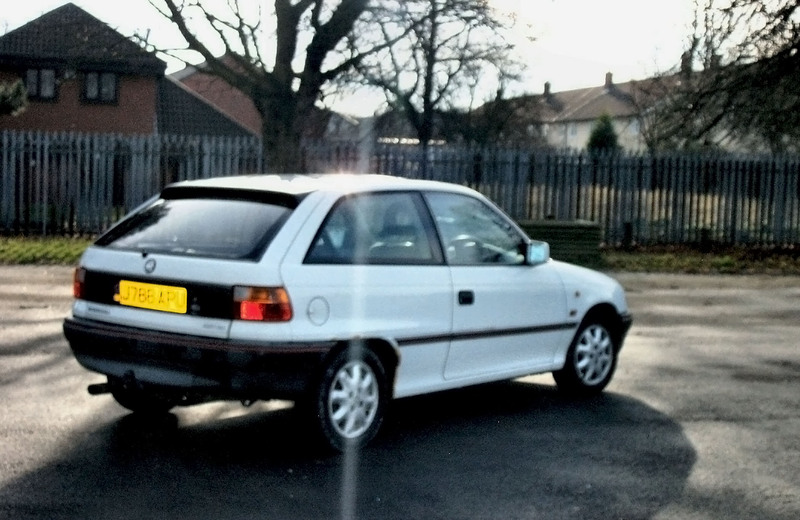 The Vauxhall Astra I did my travelling in (My first car). 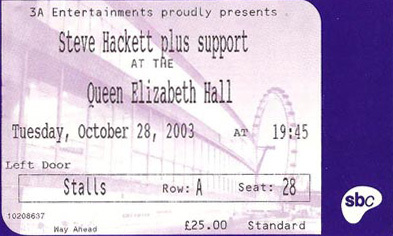 I was now a fan of Steve Hackett and I wanted to learn about his albums and see more tours, when Steve announced a new tour for the spring of 2004 I was quite surprised and I made plans to see as many gigs as I could. 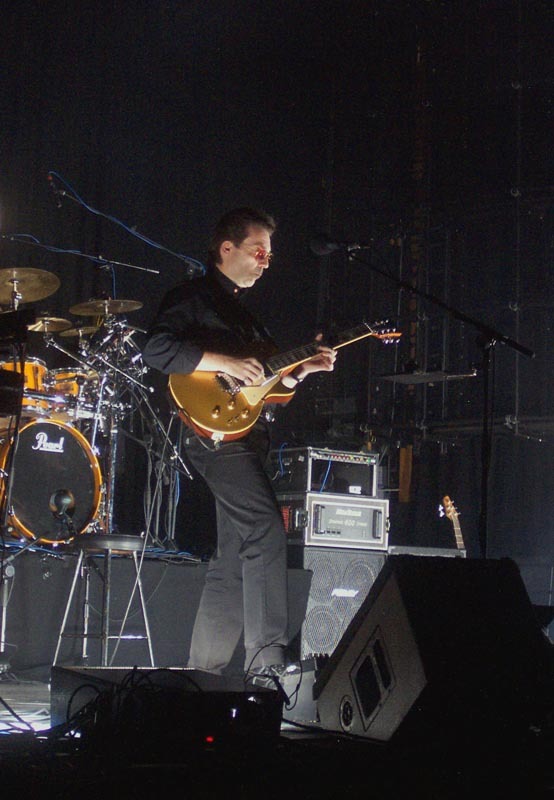 Parts of the tour was recorded and released in 2004 as Live Archive 03. 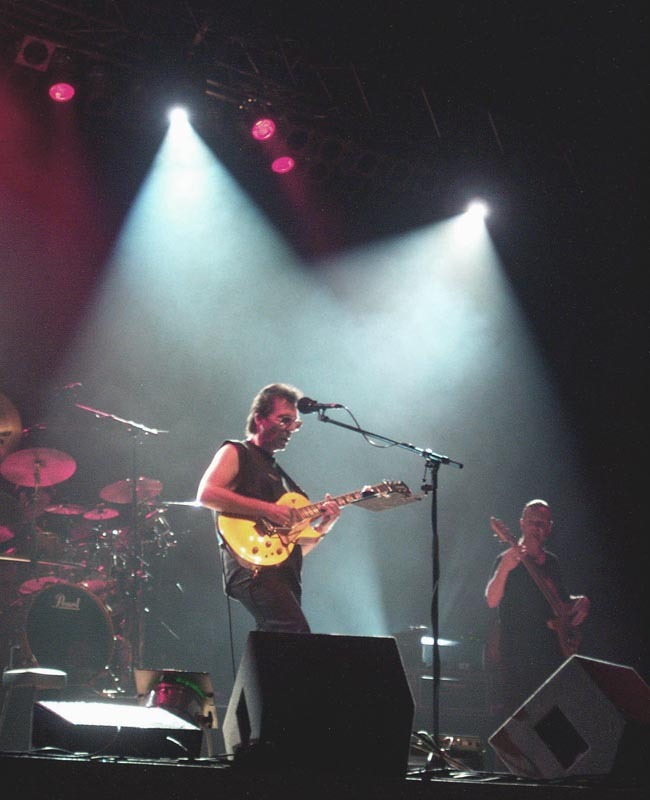 Many thanks to Paul Clark the Tour Manager who gave me a photo pass for the Leicester gig, Ben Fenner (Sound Engineer), Tigger Matthews (Lighting Engineer), The Band and of course Steve Hackett.